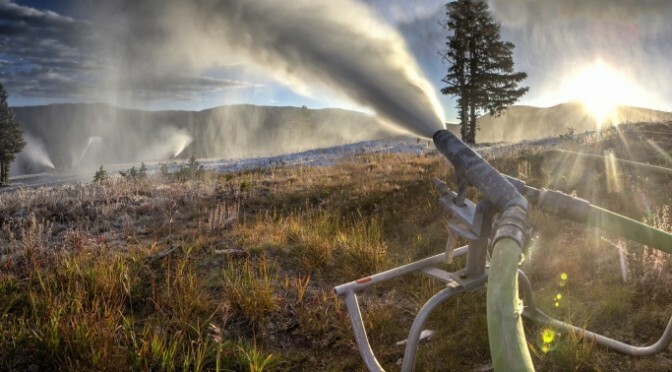 Copper Mountain, CO – The wet-bulb temperature hit 27ºF overnight at Copper Mountain, enabling the Colorado ski resort to fire up snowmaking on its Andy’s Encore trail. Copper is scheduled to celebrate its public 2015-16 Opening Day in just 32 days on Friday, Nov. 6, and expects to host U.S. Ski Team on-snow training at Copper Mountain’s Speed Center before then. Copper will introduce a full roster of Olympic medalists and World Champion alpine skiers at the First Tracks: U.S. Alpine Ski Team Naming presented by Nature Valley on November 6th. Athletes expected to attend include Mikaela Shiffrin (Eagle-Vail, Colo.), Julia Mancuso (Squaw Valley, Calif.), Ted Ligety (Park City, Utah), and Lindsey Vonn (Vail, Colo.). This public pep rally allows fans a chance to cheer on the U.S. Alpine Ski Team and send their favorite athletes off in style into the 2015-16 winter season. In conjunction with the First Tracks celebration, the Putnam Investments NASTAR Pacesetting Trials will be held at Copper on Friday, Nov. 6. Athletes set to participate include Olympic gold medalist Ligety, World Champion Daron Rahlves, two-time Olympian Kaylin Richardson and more. In May of this year, the U.S. Ski Team and NASTAR announced the Team would take on operational management of the popular citizen ski racing program.